Last night at Kingdom Gate Worship Center in Satellite Beach, FL, pastor Ken Malone shared a dream he had in 2015 from which we all can glean. Ken emphasized that this dream was not just for him personally, but has implications for a whole generation of Christians who are willing and prepared to be used of God. We heartily agree. In the dream, Ken was seated next to Franklin Graham in a meeting where Billy, Franklin’s father, was ministering on the platform. Franklin turned to Ken and said, “We’ve got to get you on the platform!” Within the dream there was a sense of anticipation of a new generation stepping into the place of responsibility and influence that Billy was stewarding. At that point, Franklin went up and spoke to his father saying, “We have to get Ken on the platform.” In agreement, Billy turned to the pianist and said, “Roosevelt, play one more verse.” Then the dream ended. After the dream, Ken discovered that Franklin D. Roosevelt was president at the time that Billy Graham received his call to ministry in Temple Terrace, Florida, not far from the Satellite Beach area. 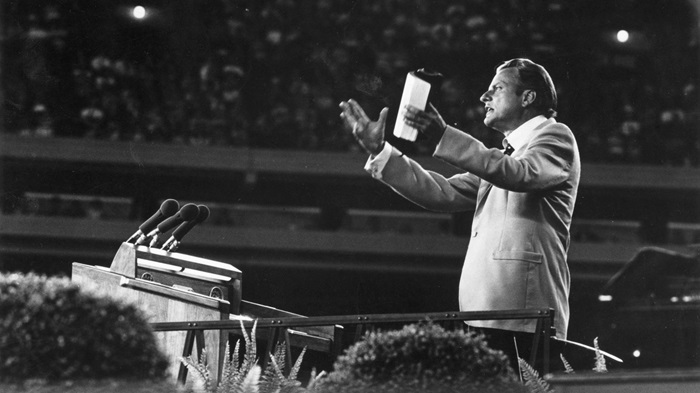 It is evident in regards to the five-fold ministry mentioned in Ephesians 4, that Billy Graham assuredly functioned in the office of an evangelist. However, it’s interesting that in this dream, Ken was not being invited into Graham’s office, but onto his platform. Perhaps the imagery highlights that on the broad platform of evangelism, there is not only room for, but need of, many to come and take their place for the sake of the harvest. A few weeks after Billy Graham’s passing, our friend Kelsey Bohlender woke up from a dream in which the whole nation was filled with the mantle of Billy Graham. She said it was as if everyone was evangelizing! In the dream, she experienced the Spirit moving everywhere and it seemed the atmosphere was thin and Heaven was near. Lou Engle has often said that dreams like this are spies that have gone into the Promised Land and come back with a good report. Let’s do the dream! Just as Elijah’s mantle came upon Elisha when he witnessed his master ascend into heaven, so Jesus promised at his ascension that the Holy Spirit would mantle us to bring His gospel to the ends of the earth. Surely, we have need of evangelists in our day - those who are gifted to cast a large net and equip the greater Body to do so. But, there is also need for all ministers of the gospel to get up on Billy Graham’s platform where both priest and king, old and young, have a role to play on the stage of history. In Nehemiah’s time, Ezra stood on a platform and opened the scriptures to all of the people. May it be so again! Let’s get up on Billy Graham’s platform and let’s pray for a whole generation of witnesses to get up there with us.